By the end of 2017, North America’s transmission network (115 kV to 765 kV) comprised over 775,543 circuit km of transmission lines. Around 83 per cent of the total line length is accounted for by the US and the remaining by Canada. 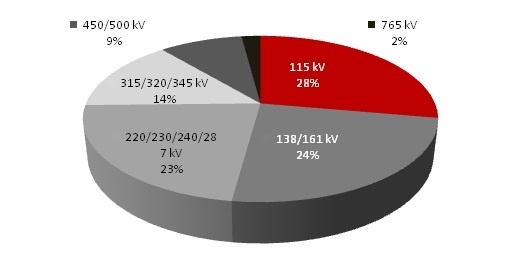 In North America, the majority or 24 per cent of line length is at the 115 kV voltage level, followed by the 138/161 kV level, while the smallest share is accounted for by the 765 kV level. 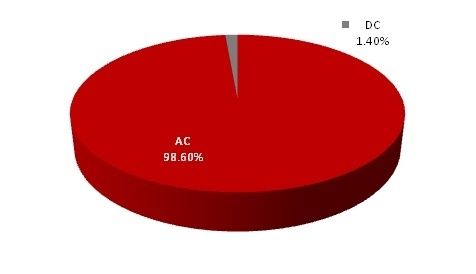 Technology-wise, around 98.6 percent of the transmission lines are based on alternating current (AC) technology. Canada’s New Brunswick, Québec, Manitoba, Saskatchewan, British Columbia and Nunavut provincial corporations act as regulated monopolies for their respective provinces. In other provinces and territories, the provincial crown corporation is responsible for large-scale generation and transmission while some investor-owned utilities undertake distribution activities. Only Ontario and Alberta have truly liberalised electricity markets. In the US, more than 93 percent of the transmission lines are owned by the traditional vertically integrated utilities (comprising IOUs and POUs). American Electric Power (AEP) is the largest electric utility in the US. Some of the other top players include Duke Energy, Southern Company, First Energy Corporation, Xcel Energy and Pacific Gas and Electric Corporation (PacifiCorp). Over the last 10 years, a trend can be seen in the emergence of transmission-only companies such as ITC Holdings and American Transmission Company (ATC). Note: Canada’s data for 2016 and 2017 estimates are based on actual projects expected to be completed in those years. US’ data for 2013 to 2017 estimates are based on projects completed in those years as per FERC's monthly Energy Infrastructure Report; data has been converted from miles to circuit miles and then to circuit km. Note: Data has been converted from circuit miles into circuit km and then into km.